7th Pay Commission : Staff unrest on reduction of percentages of Allowances-reg ** NFIR : National Federation of Indian Railwaymen, 3, Chelmsford Road, New Delhi – 110 055 ** No. 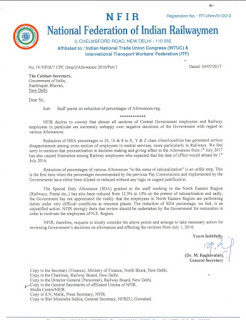 IV/NFIR/7 CPC (Impl)/Allowancd 2016/PartI, dated 24/07/2017 ***The General Secretary of National Federation of Indian Railwaymen, Dr. M. Raghavaiah writes to The Cabinet Secretary, Government of India, New Delhi conveying that almost all sections of Central Government employees and Railway employees in particular are extremely unhappy over negative decisions of the Government with regard to various Allowances. Sub: Staff unrest on reduction of percentages of Allowances-reg. NFIR desires to convey that almost all sections of Central Government employees and Railway employees in particular are extremely unhappy over negative decisions of the Government with regard to various Allowances. Reduction of HRA percentages to 24, 16 & 8 to X, Y & Z class cities/localities has generated serious disappointment among cross section of employees in central services, more particularly in Railways. We feel sorry to mention that procrastination in decision making and giving effect to the Allowances from 1st July 2017 has also caused frustration among Railway employees who expected that the date of effect would atleast be July 2016. Reduction of percentages of various Allowances “in the name of rationalization” is an unfair step. This is the first time when the percentages recommended by the previous Pay Commissions and implemented by the Governments have either been diluted or reduced without any logic or cogent justification. 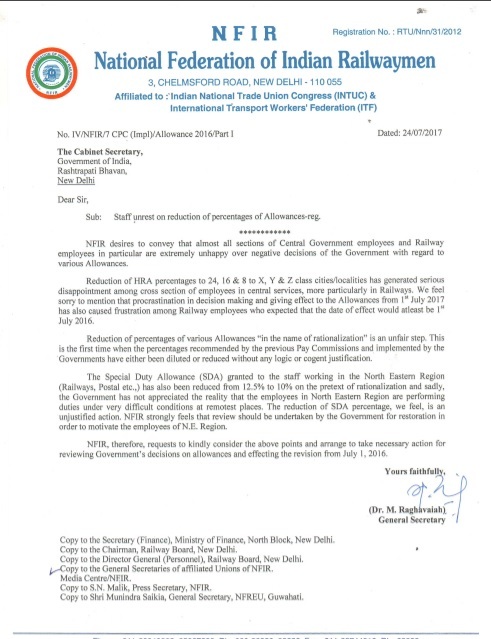 The Special Duty Allowance (SDA) granted to the staff working in the North Eastern Region (Railways, Postal etc.,) has also been reduced from 12.5% to 10% on the pretext of rationalization and sadly, the Government has not appreciated the reality that the employees in North Eastern Region are performing duties under very difficult conditions at remotest places. The reduction of SDA percentage, we feel, is an unjustified action. NFIR strongly feels that review should be undertaken by the Government for restoration in order to motivate the employees of N.E. Region. NFIR, therefore, requests to kindly consider the above points and arrange to take necessary action for reviewing Government’s decisions on allowances and effecting the revision from July 1, 2016.